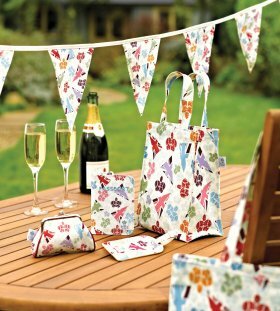 A range of Diamond Jubilee products from The Royal Parks celebrating the best of British has won the Best Licensed Product 2012 category at the Association of Cultural Enterprises Best Product Awards, announced at the annual convention in Brighton. The 'Crowns' range developed with Cambridge designers, Quintessential, is the first The Royal Parks' offering available on the high street and was launched earlier this year to celebrate the organisation's key role in The Queen's Diamond Jubilee. The design utilises The Royal Parks 'crown' logo and beautifully designed union jack prints to bring together an exciting collection inspired by the momentous celebration of The Queen's 60 year reign. Products in the 'Crowns' collection include tote bags, purses, cosmetic bags, wash bags, travel accessories and bunting which can be bought online and from high street retailers including Waterstones and Van Hage. Heather Carr, The Royal Parks commercial and sales manager, said: "This is such an exciting year for The Royal Parks, with several of London's eight Royal Parks playing a role in the Queen's Diamond Jubilee. We wanted to create a product that celebrates the best of British and really signifies the year ahead. "We are delighted to win the award, particularly to be judged by our peers and industry professionals including Emma Bridgewater. We worked closely with Quintessential to develop this range to offer people the option to buy affordable products to celebrate 2012 and all purchases will help to maintain London's natural open spaces." London's eight Royal Parks are unique. From the pageantry of St James's to world class events in Hyde Park and spectacular views in Greenwich, each park is defined by its own character and qualities. The range is epitomised by great craftsmanship, design and high quality. Prices range from £6 and proceeds will go directly towards the upkeep of the Parks. You can purchase the 'Crowns' collection online at Quintessential. Millions of Londoners and tourists visit the eight Royal Parks each year. The 5,000 acres of historic parkland provide unparalleled opportunities for enjoyment, exploration and healthy living in the heart of London. Visit the Royal Parks online store at www.royalparks.org.uk for a range of exclusively designed products which reflect the four seasons and events and celebrations that take place in the Parks. A range of carefully sourced products can be created bespoke on demand and all purchases go towards supporting the upkeep of The Royal Parks. Products include prints and maps of each of the eight Royal Parks, short stories by some of Britain's best short story writers and sweat-shirts and T-shirts made from ethically-sourced cotton.